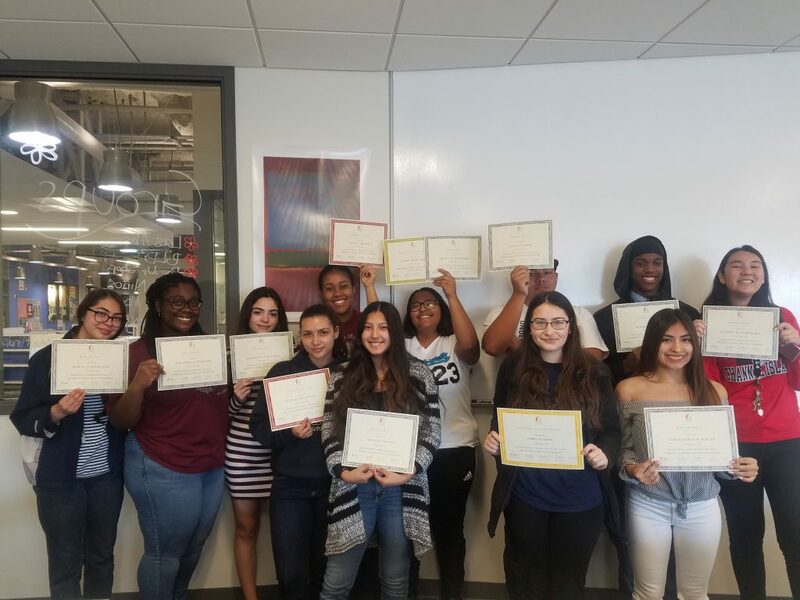 We are so proud of our Seniors for completing their first round of Senior Project POLs! While off campus, all seniors are expected to be working and will be tracked by their individual Senior Project keystone advisors. 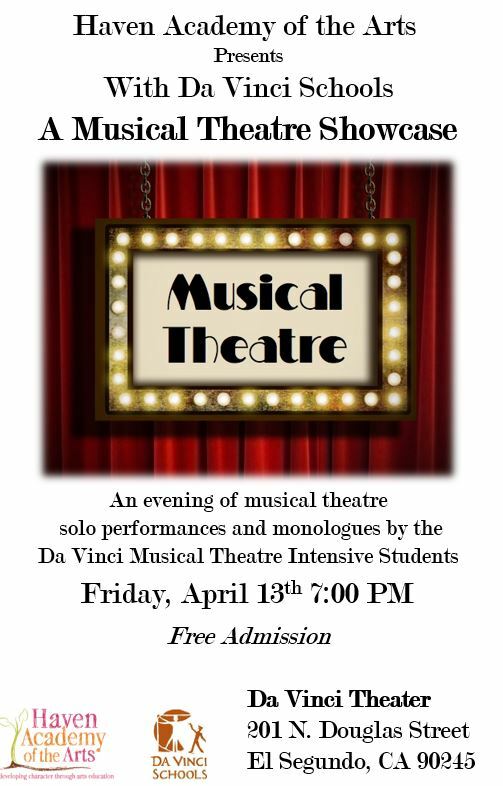 For further questions, please contact Mr. Stoll at rstoll@davincischools.org. Peer Counselor applications are available for rising seniors. 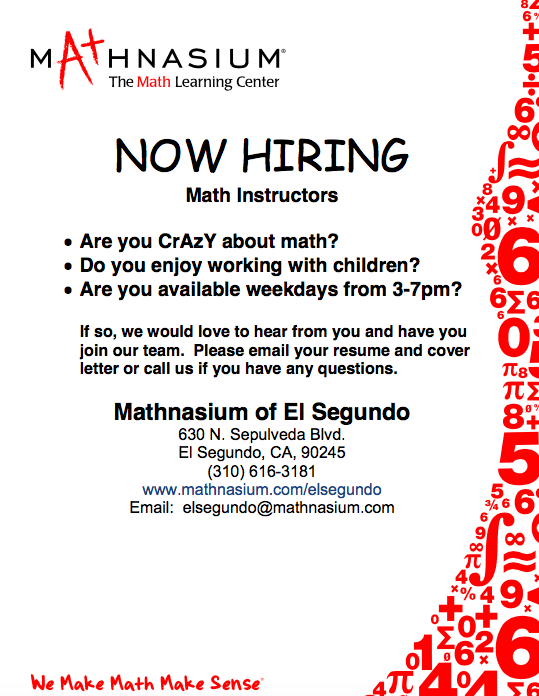 Please see counselor, Rachel Fusco, for more information. 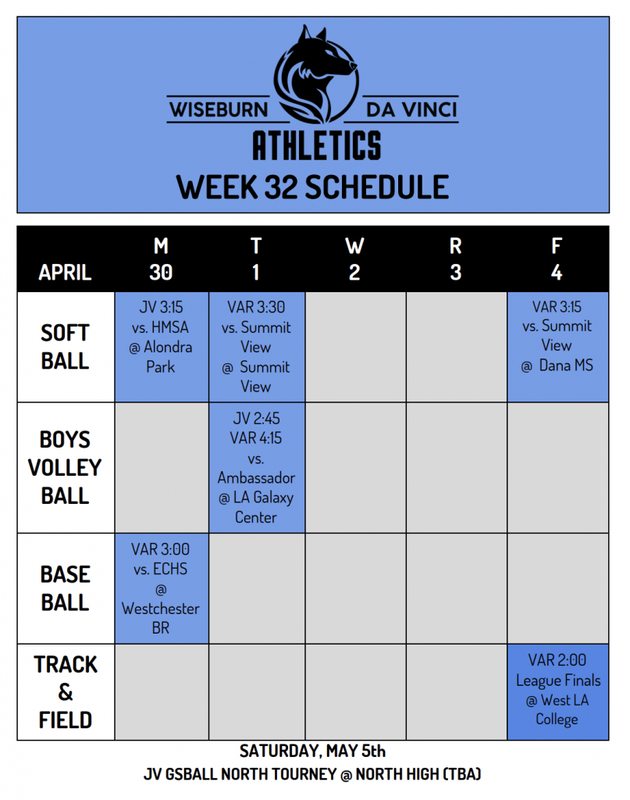 Next week’s athletics and bell schedules are included below. We look forward to another great week ahead! 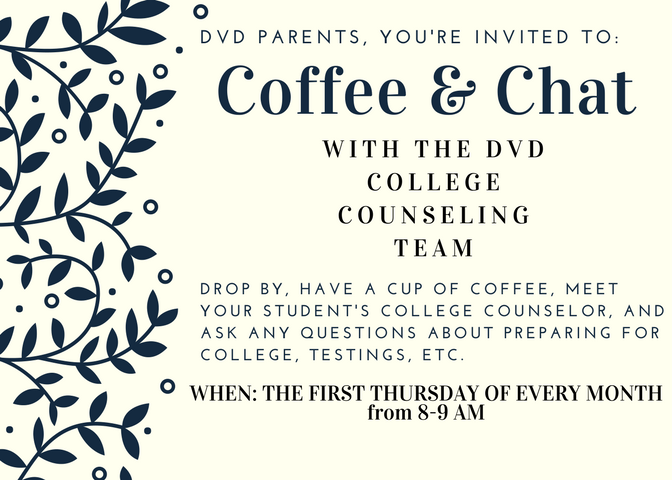 You are invited to the DVD College Counseling Team’s monthly Coffee and Chat on May 3rd! This is a great opportunity to drop by and talk with your student’s college counselor, discuss college preparation, summer opportunities, extra curricular activities, and more! 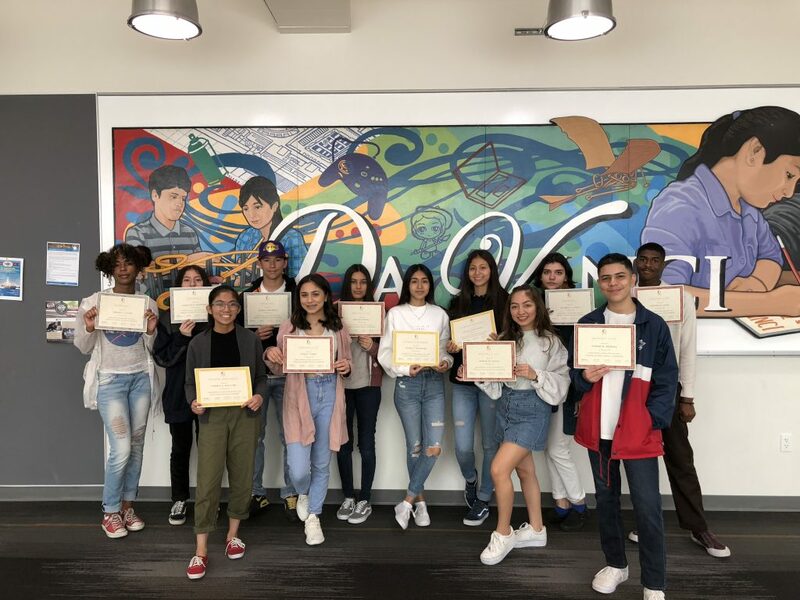 Congratulations to our Attendance and Academic Award winners! We are so proud of all of your hard work. Peer Counselor applications are now available for rising seniors. 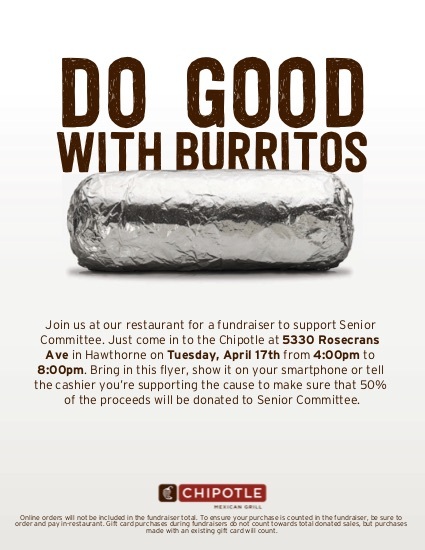 Please see counselor, Rachel Fusco, for more information. 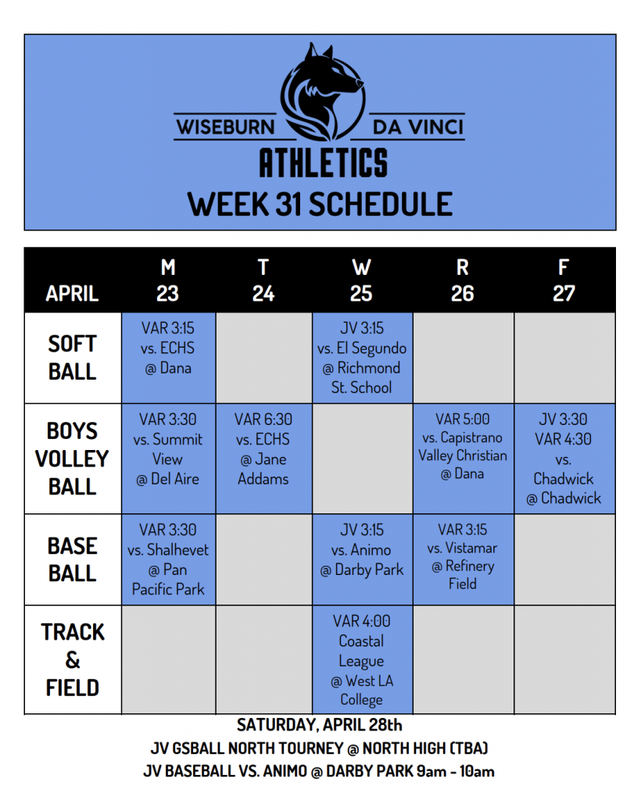 Next week’s athletics and bell schedules are included below. We hope you are enjoying your weekend! Tomorrow, Friday, April 20th, is both the anniversary of the 1999 Columbine High School shooting and a day when some young people make poor decisions regarding marijuana use. For these reasons, we ask that you have a conversation this evening with your children about their feelings regarding safety at school, and the specific details of where they will be and who they will be with both before and after school tomorrow, so that they make positive decisions and choices. We encourage all students to “see something, say something” to a DVD staff member if they are aware of anything happening that could be harmful to DVD student safety and/or our school community. South Bay One-Stop Youth Service invites your students to attend the 18th Annual Blueprint for Workplace Success Job Fair. Mark your calendars for this exciting event! More than 50 employers and community agencies will be available with part-time and summer job opportunities for student’s 16 – 24 years old. Interested in scholarship money? KidGuard Education is offering multiple essay scholarships ranging from $500-$1,000 for students at Da Vinci Schools! This scholarship will now be an annual opportunity. The deadline is every year on Oct. 31. This annual scholarship is provided to all students and can be used towards any education-related expenses (tuition, books, stationary etc). 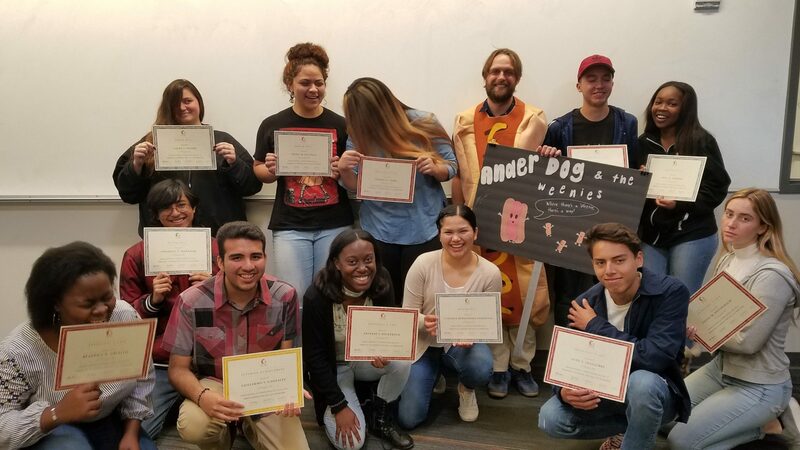 You’re invited to Ryman Art’s Application Day on Saturday, May 5th at Cal State University, Fullerton! Ryman Art’s is an art organization based in Los Angeles that offers intensive studio art instruction, college and career guidance, art supplies, and support services—all at no cost to the student. In the past, many DVD students have been admitted into the program. The event will be a great opportunity to learn about the program as well as participate in a drawing workshop hosted by Ryman Art’s faculty. This free workshop is for current 8th – 11th grade students. Students can used the drawings created on that day for their application to the program. This event is a great way for students, families and educators to get a feeling for what Ryman Arts is really like. This workshop is free and suitable for all skill levels, all supplies and materials are provided. Students can choose between a morning (9:00 am – 12:30 pm) or afternoon (1:00 pm – 4:30 pm) session. To sign up students must email their name, session time, grade and high school name to agarcia@ryman.org. Don’t forget that Summer Internship Applications are due today! Your students can also pick up Leadership Applications near the DVD front office. These are due Friday, April 20th. 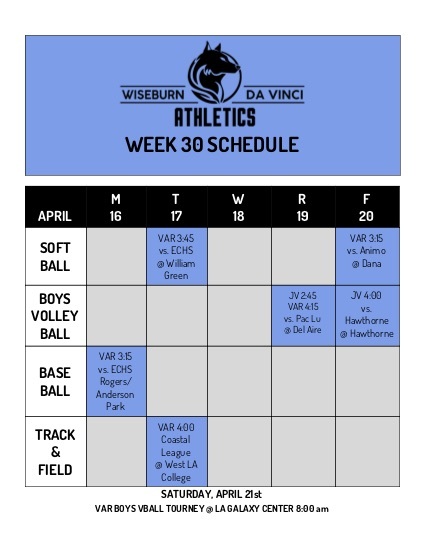 The athletics schedule, bell schedule and upcoming events are included below. We hope you have a great weekend!